Hook gripping is one of those things that just isn’t that nature. Most of us think it’s outright painful at first. But with time we adapt and find its benefits. The major one being that it allows us to loosen our grip pressure on the bar, which converts to faster turnover. 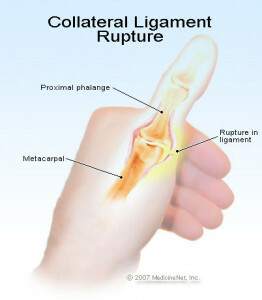 The downfall is it puts a lot of stress on the 1st MCP (metacarpophalangeal joint) of the thumb. The stress is referred to a radial stress because it places pressure on the radial collateral ligament of the thumb. Today’s taping is designed to reduce some of the stress on the radial side of the thumb capsule. …. and before you all ask, yes, yes… you can use this tapping underneath your “girly” thumb taping. Take a look at the pic above. 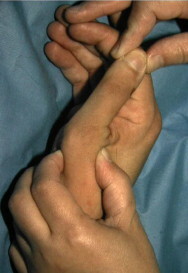 This is what we would consider radial laxity in the thumb. The picture to the right depicts radial ligament irritation/injury. Our goal today is to support the radial ligament in the thumb. Christmas is over… everyone back to work. 1. Practice one radial collateral ligament taping.